The book looks at the nature of personal talent and creativity and the conditions in which it flourishes. The more complex the word becomes, the more creative we need to be to meet its challenges. I trust you will find a great deal here to interest and engage you. These standards were designed for other times and for other purposes. We are living in a world that is changing faster than ever and facing challenges that are unprecedented. Creativity is a rare talent. A culture of creativity has to involve everybody, not just a select few. We are not going back to the good old days. Government are pouring vast resources into education reform. Parent lie awake at night worrying about the quality of their children's education. Lead a life that has meaning and purpose. After the arrival of television, the world was never the same place again. Some people struggled to see why it would replace horse and carriages. Like the printing press, the motorcar changed the world in ways that its inventors could not have imagined. He could not have foreseen the mushrooming expansion of the Internet. The evolution of the Internet has been driven not only innovation in technology but also by unleashing the imaginations and appetites of millions of users, which in turn are driving further innovations in technology. Digital technologies are blurring the boundaries between home and work, business an pleasure. We live in a time when the ability to adapt is critical. There is no agreed definition of intelligence. 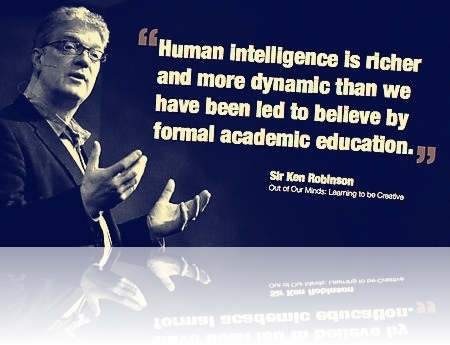 Human intelligence is much richer than we have been led to believe by industrial/academic education. You are more than you think. For most of them it's the first time that they'll be seen in a positive light. Make groundbreaking contribution in their own area of work. Creating a place where children feel safe and challenged. Graduates leave with a sense of capability, endurance and resilience, owning a confidence about taking on enormous challenges in there lives. A deep sense of value, of being loved and appreciated, and a trust for group process and cooperation, enables them to feel that excellence is in their own hands. Students are encouraged to be leaders and schools leaders are encouraged to be visionaries. our schools strive to create a respectful, diverse, creative, exciting and reflective culture. We are building a school system that inspires and awakens the possibilities of an engaged and vital life within our youth. Everyone has a stake in the future of education. Imagination is the process of bringing to mind things that are not present to our senses; creativity is the process of developing original idea that have value; innovation is the process of putting new ideas into practice. Everyone has a huge creative capacities as a natural result of being a human being. The challenges is to develop them. A culture of creativity has to involve everybody not just a select few. Being creative does usually involve playing with ideas and having fun, enjoyment and imagination. But creativity is also about wiring in a highly focused way on ideas and projects, crafting them into their best forms and making critical judgments along the way about which work best and why. In every discipline, creativity also draws on skill, knowledge and control. It's not only about letting go, it's about holding on. We are all born with immense natural talents but that too few people discover what they are and even fewer develop them properly. Ironically one of the main reasons for this massive waste of talents is the very process that it meant to develop it: education. The problem is that many of our established ways of doing things, in business, in government and education, are rooted in old ways of thing They are facing backwards, not forwards. The impossible yesterday is routine today, Wait until tomorrow. Civilization is a race between education and catastrophe. The problem is that too often and in too many ways, current systems of mass education are a catastrophe in themselves. Far from looking to the future, too often they are facing stubbornly the past. The front-loading model of education: you accumulate your educational resources at the beginning of your life and you eke them out gradually as you get older. It's also called gas tank mode: you are filled up in your mouth with an initial supply of education, which is meant to see you through the rest of life's journey. Technology, is not technology if it happened before you were born. We don't teach people how to deal with failure and this is a fundamental oversight. Our ideas can enslave or liberate us. We ask how we can measure intelligence. The assumption is that intelligence is quantifiable. We ask how can raise academic standards but do not question whether they deliver what we need to survive in the future. We ask where we can find talented people but ignore the talents of people that surround us. We look but we do not see, because our traditional common-sense assessment of abilities distract us from what is actually there. We ask how to promote creativity and innovation but stifle the processes and condition that are most likely to bring it about. 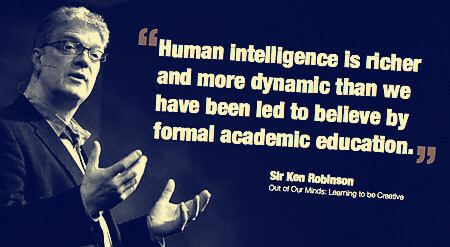 Intelligence is not only diverse: it is highly dynamic. If you're interested in the ultimate character of the physical world, at present time our only way to understand it is through a mathematical type of reasoning. We see the world not as it is, but through a veil of conception. (1.Just when I discovered the meaning of life, they changed it. Creativity is a dialogue between the ideas and the media in which they are being formed. Dancers think physically. when I ask how many of his experiments fail, he(Chemist Sir Harry Kroto) said: you're just finding out what doesn't work. Albert Einstein: Anyone who has never made a mistake, has never tried anything new. I don't mean to say that being wrong is the same thing as being creative but if you're not prepared to be wrong, it's unlikely that you'll ever come up with anything original. Personal creativity often comes from a love for particular materials. I spoke once with a professor of physics from California. He described himself as a native speaker of algebra. Being good at something isn't a good enough reason to spend your life doing it. 1.If one does not understand a person, one tends to regard him as a fool. 2.Children are educated by what the grown-up is and not by his talk. 3.There are many nights as days, and the one is just as long as the other in the year's course. Even a happy life cannot be without a measure of darkness, and the word happy would lose its meaning if it were not balanced by sadness. It is fa better take things as they come along with patience and equanimity. 4.There is no coming to consciousness without pain. 5.A collection of a hundred great brains makes one big fathead. 6.The greatest and most important problems in life are all in a certain sense insoluble. They can never be solved, but only outgrown. 7.Your vision will become clear only when you can look into your own heat. Who looks outside, dreams; who looks inside, awakens. 8.Everthing that irritates us about others can lead us to an understanding of ourselves. 9.The creation of something new is not accomplished by the intellect but by the play instinct acting from inner necessity. The creative mind plays with the objects it loves. 10.We cannot change anything unless we accept it. Condemnation does not liberate, it oppresses. 11.The least of things with a meaning is worth more in life than the greatest of things without it. Education should develop the whole child and not just their academic abilities. It should engage their feelings. physical development, moral education and creativity. Knowledge of self is a important as knowledge of the external world. Exploring personal feelings and values is essential and so are opportunities to exercise imagination and self-expression. One of the main roles of teachers is to draw out the individual in every child. In this sense, education is a process of self-realization. They argued in different ways that children should be allowed to follow a natural pattern of development rather than a standard course of instruction. Above all, naturalist wanted to address the whole child: mind, body and spirit. They promote the idea of the individual breaking free from the constraints of culture. For the rationalists, the individual becomes independent of cultural influences by the power of rational, objective though. Since objective knowledge exist independently of people and culture, the rational individual is free of culture bias and sees the world just as it is. For the naturalist, the aim is to liberate the individual spirit from the pressures of culture and reveal the authentic self. How we feel about something is an expression of our relationship with it, In that sense, feelings are evaluations. As Isaac Newton famously said, if he saw further than others, it was because he stood on the shoulder of giants. As Victor Hugo said, "nothing is more powerful than an idea whose time has come." Nurture a culture where everyone can have new ideas. Education is not a linear process of preparation for the future: it is about cultivating the talents and sensibilities through which we can live our lives in the present and create the future for ourselves. Personal: to develop student's individual talents and sensibilities. Cultural: to deepen their understanding of the world around them. Economic: to enable them to earn a living and be economically productive. As Socrates famously express it ,"Education is the kindling of a flame, not the filling of a vessel." All students have different interests, and learning styles. What and how they are taught has to engage their energies, imaginations and their different ways of learning. No one can be made to learn against his or her will. Learning is a personal choice. Some people argue that personalizing education for every student is an impossible pipe dream: it would be too expensive and teachers simply could not give every student the necessary time and attention. There are two answers to this argument. The first is that there is absolutely no alternative. Education is personal or it is nothing. Personalized learning is an investment not a cost. The second argument is that it is possible to personalize learning for every student. One of the way is can be done is through the creative use of new technologies. Information technologies are among the driving forces of the economic and culture revolution and one of the reason why the industrial model of education is becoming obsolete. Some of the most powerful tool for promotion creativity, communication and collaboration ever devised now offer unprecedented opportunities for education to be personalized. Creativity is not about a lack of constraints, often it is about working within them and overcoming them. The dynamics of culture are such that change travels in all directions. With the power of the Internet and of social networking, ideas and innovations can move quickly and inspire others to action. Sensitive policy makers will feel the change and may even say it was their idea. The task of education is not to teach subjects: it is to teach students. No school is better than its teachers. When you think of your own time at school it is the people you remember: your contemporaries, and especially the teacher: the ones who turned you on and the ones who turned you off; who build you up or knocked you down. In the right context, a casual remark by a teach , or even a raised eyebrow or tone of voice can set you on a lifelong journey of discovery or put you off taking even the first step. Creativity depends on interaction between feeling and thinking, and across different disciplinary boundaries and fields of ideas. Mastery in teaching is like mastery in any other profession. Knowing which to draw from to meet the needs of the present situation is a process of connoisseurship that expert teachers also share. There is a different between teaching through creativity and teaching for creativity. Good teachers know that their role is to engage and inspire their students. This is a creative process in itself. Too many teaches are hired for knowledge of their discipline rather than their interest in students. Good teacher requires personal knowledge as well as the ability to engage others. Teaching for creativity is about facilitating other people's creative work. Teaching for creativity involves asking open-ended question where there may be multiple solutions; working in groups on collaborative projects, using imagination to explore possibilities. Teaching for creativity involves teaching creatively. There are three related tasks in teaching for creativity: encouraging, identifying and fostering. Encouraging: the first task in teaching for creativity in any field is to encourage people to believe in their creative potential and to nurture the confidence to try. Other attitudes important for creative leaning include: high motivation and independence of judgment; a willingness to take risk and be enterprising, to be persistent and to be resilient in the face of false starts, wrong turns and dead ends. Identifying: a second role is to help students to discover their own creative strengths. Knowledge can be generated in many ways other than in words and numbers. Not everything we know can be put into words and numbers, nor are words and numbers all that we know. It is far all these reasons that schools have to offer curricula that are broad and balanced. The implication of diversity is that breadth in schools should be balanced by depth. Alongside any common curriculum, there have to be opportunities for students to go more deeply into areas that interest them particularly. A narrow, unbalanced curriculum will lead to narrow, unbalanced education. Assessment is the process of making judgments about students’ progress and attainment. The problem for creative education is not the need for assessment, but the nature of it. Assessment should support students’ learning and achievements. In practice, it tends to dominate the priorities and general ethos of education. An assessment has two components: a description and a comparison. Assessments compare individual performances with others and rate them against particular criteria. One problem with systems of assessment that use letters and grades is that they are usually very light on description and very heavy on comparison. A second problem in grade-based assessment is that a single letter or number does not convey the complexities of the process that it is meant to summarize. And some outcomes cannot be adequately expressly in this way. As Eliott Eisner once put it, “not everything important is measurable and not everything measurable is important.” One way to enhance the value of assessment is to separate out these elements of description and comparison. Portfolios of various sorts allow for detailed descriptions of the work that students have actually done, with examples and reflective comments by themselves and others. Providing clear and detailed criteria is also a way of improving the transparency of assessments. Peer group assessment is a process by which students contribute to the judgments of each other’s work and to the criteria by which it is assessed. These approaches can be especially valuable in both formative and summative assessments of creative work. Transforming education is not easy but the price of failure is more than we can afford, while the benefits of success are more than we can imagine.